March 28 - World Archery (WA) has today announced a four-year sponsorship deal with Fila for its World Cup and World Championships circuit, which will see the Italian sportswear brand provide clothing for WA judges, officials and staff. 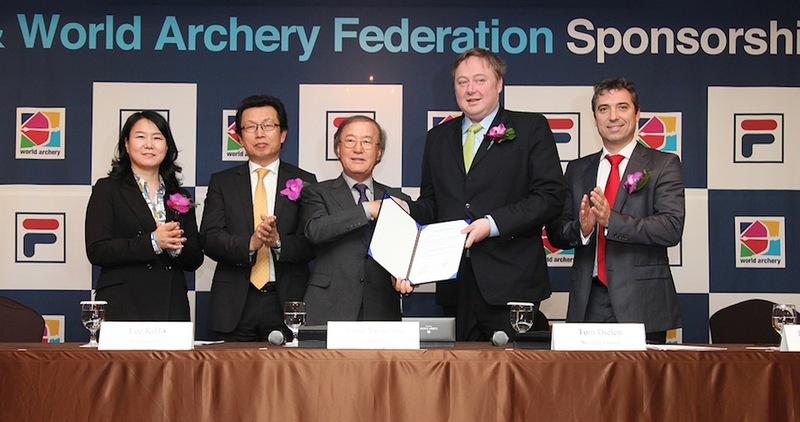 The agreement was signed today in Seoul, South Korea, where the company is now based, with delegates from both parties present along with International Archery Federation (FITA) Female Archer of the 20th Century Soo Nyung Kim, who took four Olympic and World Championship gold medals over her illustrious career. Fila currently have major sponsorship deals with athletes such as Serbian tennis players Janko Tipsarevic and Jelena Jankovic, South Korean golfer Han Hee-Won, as well as Brazil's national indoor football team and the South Korea Skating Union. "Archery allows a partner such as Fila to be visible in very exciting venues like the World Cup Final in Paris later this year, where the arrows will be shot at the Trocadero Fountain with the Eiffel Tower in the back of the targets," said WA secretary general, Tom Dielen. "Archery also brings Fila to join other major global brands such as KIA Motors, Turkish Airlines and Longines as partners of an important core Olympic sport and I am convinced that today is the start of a long-term relationship between FILA and World Archery," he concluded. The Archery World Cup has been held since 2006, and this year's edition kicks off in Shanghai from May 13-19, with three subsequent events in Antalya, Turkey, Medellin, Colombia and Wroclaw in Poland. The Outdoor World Archery Championships will take place in Belek Antalya in Turkey from September 29 to October 6, with the World 3rd Championships set to take place in Sassari, Italy in October this year.